Credit: Nishizawa H, Takashi Y et al. Nonalcoholic steatohepatitis (NASH) has been emerging worldwide and effective treatment, especially for liver fibrosis, is essential for improving the prognosis. A Japanese research team has identified and clarified the mechanism for a hormone that limits the fibrosis associated with NASH and cirrhosis. This discovery has potential applications for the treatment of these conditions. These findings were published on October 10 in the online version of Scientific Reports. The research group was led by Associate Professor TAKAHASHI Yutaka (Division of Diabetes and Endocrinology, Department of Internal Medicine, Graduate School of Medicine) and medical research fellow NISHIZAWA Hitoshi (Division of Diabetes and Endocrinology, Kobe University Hospital). NASH is a progression of nonalcoholic fatty liver disease (NAFLD) in the context of obesity and diabetes, resulting in fatty deposits, inflammation and fibrosis. In some cases fibrosis develops into liver cirrhosis or liver cancer, shortening life expectancy. NAFLD is closely associated with metabolic syndrome, and cases of NASH are increasing along with obesity and diabetes – an estimated three to four million patients in Japan currently suffer from NASH. It is becoming a serious public health issue. Liver fibrosis (including its manifestation in liver cirrhosis) is strongly associated with increased mortality, so the development of drugs to control fibrosis is a pressing issue. However, current medicines only have limited effectiveness. The prevalence of fatty liver and NASH are very high in patients with growth hormone (GH) deficiency, and the research group has demonstrated that this was caused by a lack of insulin-like growth factor-I (IGF-I), which is mainly induced by growth hormone. The group has further proved that administering growth hormone alleviated the NASH conditions caused by adult growth hormone deficiency, and treatments of GH and IGF-I were effective when applied to model animals with growth hormone deficiency. 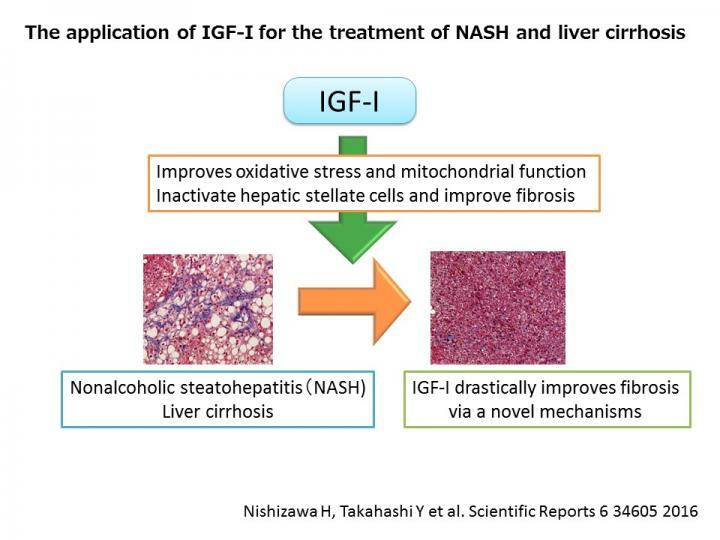 In order to clarify the potential clinical applications of IGF-I on common forms of NASH and liver cirrhosis, they investigated its effectiveness on animal models, and discovered that it was drastically effective in improving the characteristics of NASH, especially fibrosis. First, they used a model mouse suffering from obesity-related NASH to test the effects of IGF-I. After one month of administering IGF-I, they noted drastic positive changes in the characteristics of NASH: fatty deposits, inflammation and fibrosis. In a model mouse, who had developed liver cirrhosis, they also noted ameliorations in fibrosis. After investigating the mechanism behind this, they discovered that IGF-I acts on hepatic stellate cells, which play a key role in the development of fibrosis. IGF-I suppresses the activation of these cells by causing cellular senescence and consequently preventing fibrosis. IGF-I also improved mitochondrial function and oxidative stress in the liver (both causes NASH), alleviating fatty deposits and inflammation. Medication that suppresses NASH-related liver fibrosis and other complications is currently very limited. These findings suggest that IGF-I can be used to prevent the development of fibrosis, and thus improve prognosis and alleviate complications for sufferers of NASH and cirrhosis. IGF-I may also be effective on models for cirrhosis related with viral hepatitis, because the activation of stellated cells is a common pathway to fibrosis. The unique mechanism for IGF-I has been clarified, and combination with other medications could potentially lead to a breakthrough in medical treatment for fibrosis. 1. NASH (non-alcoholic steatohepatitis): Despite not consuming large amounts of alcohol, the patient shows fatty deposits, inflammation and fibrosis just as with alcoholic hepatitis. A condition linked to obesity, diabetes, and dyslipidemia. 2. GH (growth hormone): A hormone that promotes growth, which is secreted by the pituitary gland and induces the production of IGF-I. 3. IGF-I (insulin-like growth factor-I): Mainly produced in the liver, a growth factor that promotes cell proliferation and survival in various cell types including neurons and myocytes.